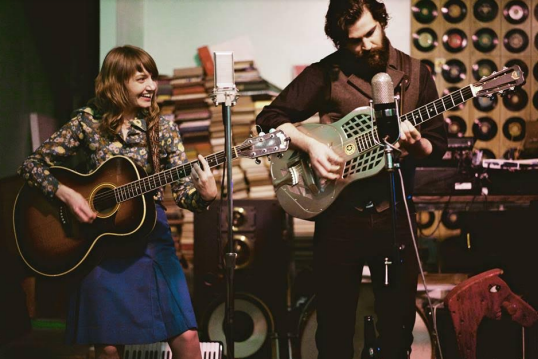 Lac La Belle is an acoustic duo from Detroit, Michigan. Made up of multi-instrumentalists Jennie Knaggs & Nick Schillace, Lac La Belle is influenced by early Americana, blending history with the present to create stories that capture the human experience via accordion, mandolin, banjo, ukulele, organ, harmonizing vocals, and finger-picking resonator guitar. Their latest album, “A Friend Too Long”, was recorded in their Detroit home during the snowiest winter on record. Thank you for your support! This show closes out our fall season. The Living Room will be back on January 19th with a show featuring Detroit female quartet Lorelie! Directions: Going north on I-75 north take exit 84A and continue north on Baldwin Rd 1.9 miles. Unity of Lake Orion is located on the west side of Baldwin, between Maybee and Waldon Rds. The church is set back from the road and shares a stubby driveway with Dollar General. Turn west into Dollar General and then jog left into the church parking lot.